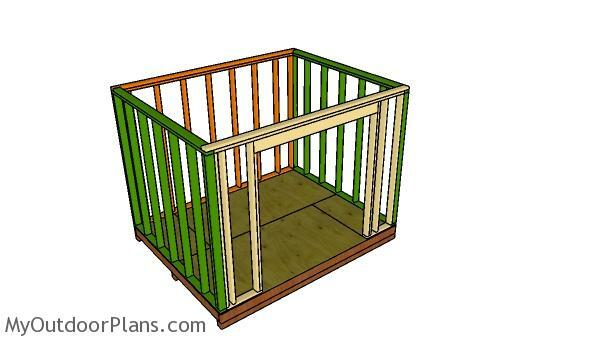 This step by step diy project is about 8×10 shed plans. I have designed this shed so you can store lots of items in a proper manner. 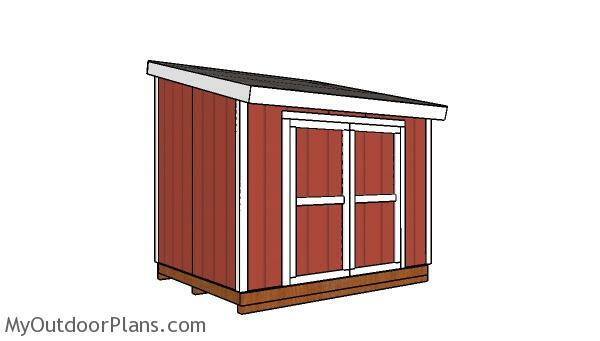 The frame of the shed is sturdy and there is an easy access inside using the double front doors. Take a look over the rest of my woodworking plans, if you want to get more building inspiration. When buying the lumber, you should select the planks with great care, making sure they are straight and without any visible flaws (cracks, knots, twists, decay). Investing in cedar or other weather resistant lumber is a good idea, as it will pay off on the long run. Use a spirit level to plumb and align the components, before inserting the galvanized screws, otherwise the project won’t have a symmetrical look. The first step of the project is to build the floor frame. 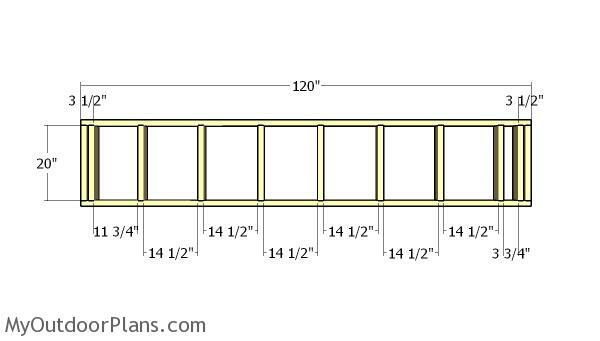 Cut the components from 2×6 lumber, as shown in the diagram. 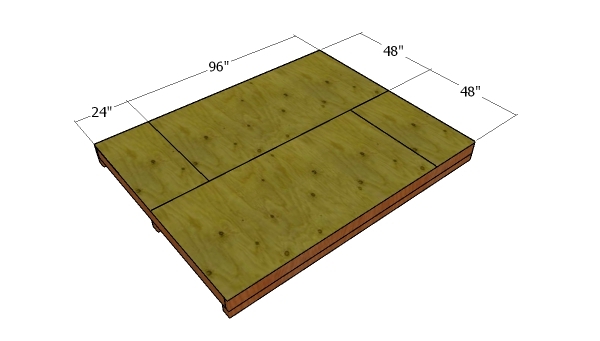 Place the joists every 16″ on center, for a professional result. 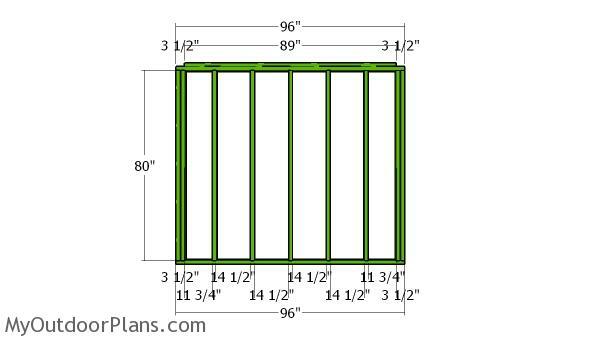 Check if the corners are are square, drill pilot holes through the rim joists and insert 3 1/2″ screws. Select the location for the shed and level the surface thoroughly. Remove the vegetation layer and make sure you comply with the local building codes. Fit the skids on the location. 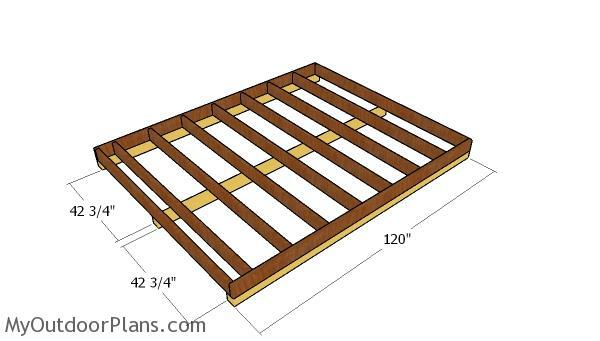 Place the floor frame and then use rafter ties to lock the skids to the frame. Align the edges with attention for a professional result. Fit the 3/4″ plywood sheets to the floor frame and align the edges with attention. Insert 1 5/8″ screws every 8″ along the joists. Leave no gaps between the sheets for a professional result. 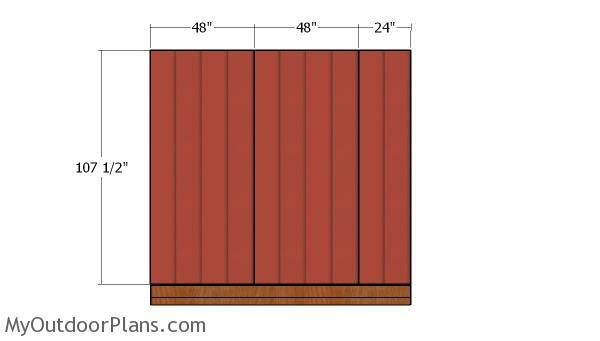 Build the back walls of the shed from 2×4 lumber. Drill pilot holes through the plates and insert 3 1/2″ screws into the studs. Align the edges and make sure the corners are square. Alternatively, you could use framing nails and a framing gun. 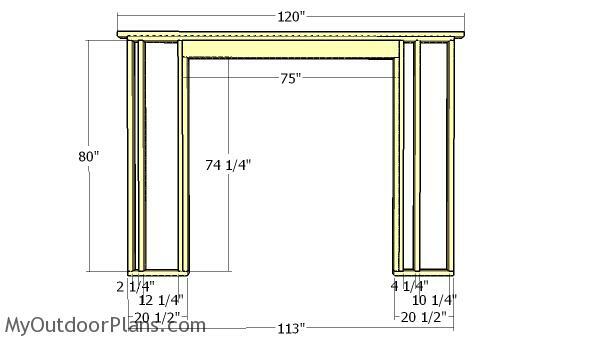 Continue the project by assembling the front wall frame. 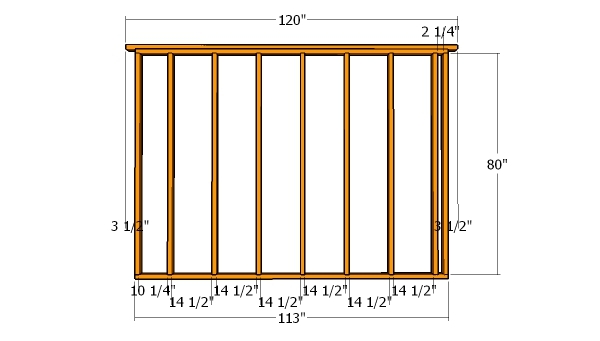 Use 2×4 lumber for the front wall frame. Use 2×6 lumber and 1/2″ plywood for the double header. Drill pilot holes through the plates and insert 3 1/2″ screws into the studs. Make sure the corners are square and align the edges flush. You can adjust the size of the door opening to suit your needs. 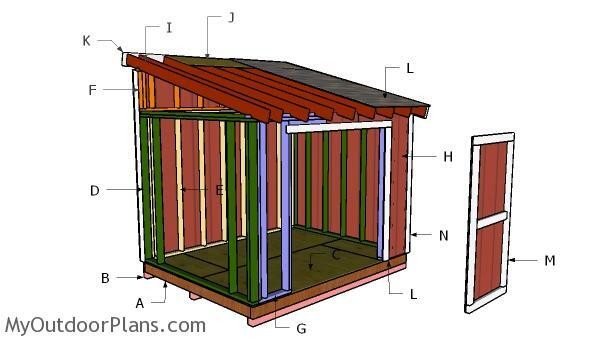 Build the back wall for the shed using the same techniques described above and the information from the diagram. Fit the wall frames to the floor of the shed. Align the edges with attention and plumb the walls with a spirit level. Drill pilot holes through the bottom plates and insert 3 1/2″ screws into the floor. Lock the adjacent walls together tightly using 3 1/2″ screws. 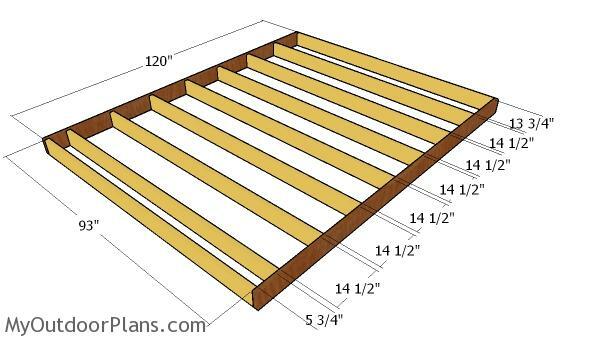 Use 2×4 lumber for the top back wall frame. Cut the components at the right dimensions and then lay them on a level surface. Drill pilot holes through the plates and insert 3 1/2″ screws into the studs. Place the wall to the top of the shed frame. Align the edges with attention, drill pilot holes and insert 3 1/2″ screws to lock them into place tightly. Fit the sheets to the front of the shed. As you can see in the diagram, you need to make the cuts so you create the door opening. Fit the T1-11 siding panels to the back of the shed. Align the edges with attention and leave no gaps between the sheets. Insert 6-8d nails every 8″ along the framing. Make sure you check out PART 2 of the shed, where I show you how to build the lean to roof. 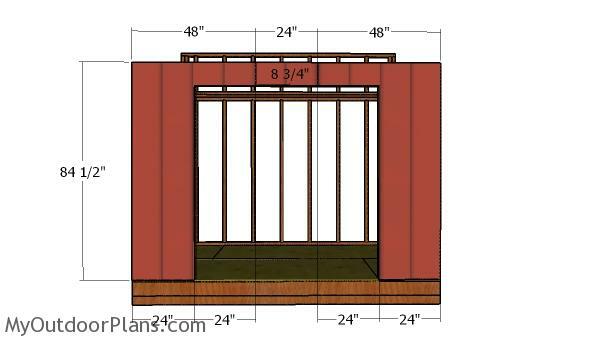 Take a look over PART 2 and PART 3 of the project, so you learn how to build the double doors and the roof. 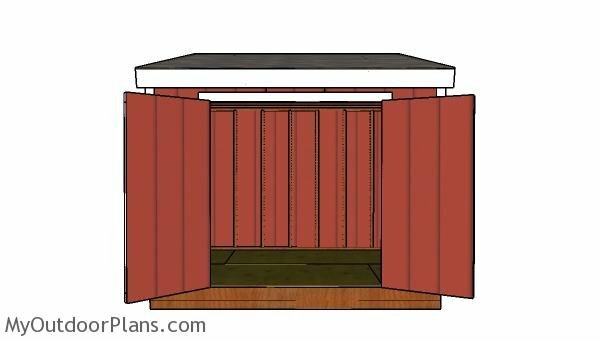 I have lots of other shed projects on the site so I recommend you to browse through all alternatives before starting the building project. See all my shed projects HERE. 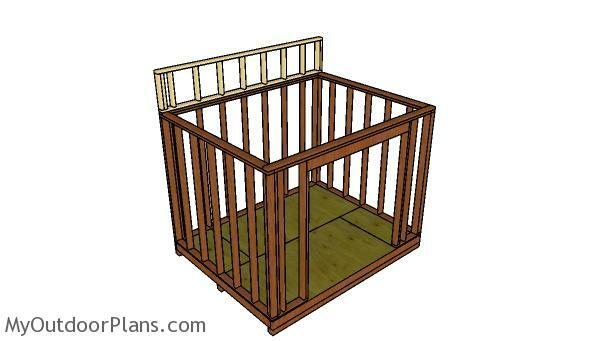 This woodworking project was about 8×10 lean to shed plans free. If you want to see more outdoor plans, check out the rest of our step by step projects and follow the instructions to obtain a professional result.